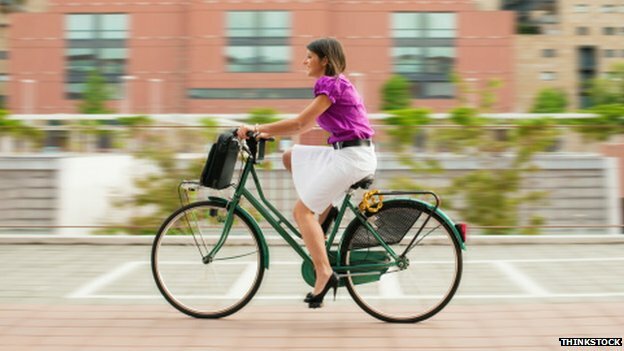 Switching from driving a car to walking or cycling to work improves our well-being, a study suggests. 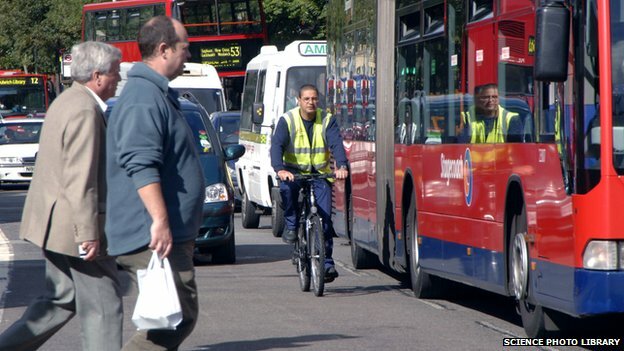 Active commuters felt better able to concentrate and under less strain than when travelling by car, University of East Anglia (UEA) researchers said. Even going by public transport was preferable to driving, data from 18,000 UK commuters over 10 years suggested. Researchers said policies encouraging people to leave their cars at home could have a big impact on well-being. The physical health benefits of exercise are already well known and this study reinforces the idea that there are positive psychological effects too. The study, carried out at UEA's Norwich Medical School and the Centre for Health Economics at the University of York, used data on nearly 18,000 adult commuters from across the UK over 18 years. Out of this group, 73% said they went to work by car, 13% walked and 3% cycled to work. About 11% used public transport on their commute. Those who had an active commute were found to have a higher level of well-being than those who went by car or public transport. When researchers analysed the wellbeing of a small group who swapped the car or bus for a bike or going on foot, they found they became happier after the switch. The study looked at feelings of worthlessness, unhappiness, sleepless nights, and being unable to face problems. The researchers also accounted for numerous factors known to affect well-being, including income, having children, moving house or job, and relationship changes. Lead researcher Adam Martin, from UEA's Norwich Medical School, said: "Our study shows that the longer people spend commuting in cars, the worse their psychological well-being. And correspondingly, people feel better when they have a longer walk to work." Mr Martin said the study's finding that commuters felt better when travelling by public transport, compared with driving, was "surprising". "You might think that things like disruption to services or crowds of commuters might have been a cause of considerable stress. "But as buses or trains also give people time to relax, read, socialise, and there is usually an associated walk to the bus stop or railway station, it appears to cheer people up." The UK Faculty of Public Health welcomed the findings of the study, published in the journal, Preventive Medicine. It said streets that were for people, rather than cars, promoted neighbourliness and helped everyone to have happy communities.